The European Central Bank President said that no decision has been taken on the IBRC promissory note. PRESIDENT OF THE European Central Bank (ECB), Mario Draghi has said that the ECB “took note” of the Irish government’s decision to liquidate IBRC. 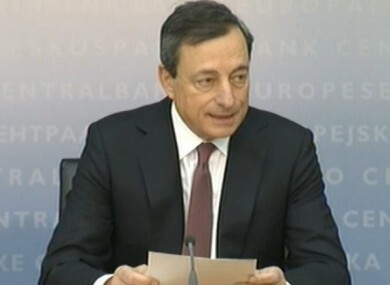 In a press conference today, Draghi was questioned on reports that Ireland and the ECB had reached a deal on the promissory note, but he would not be drawn on it, saying only that it was not “a decision to take”. “We said simply that we took note of this – we all took note of this,” he added. When asked if the ECB would now accept the Irish government bond as collateral, Draghi said he did not “want to enter into the details of the swap”. “One thing I will add is that there is no more ELA [Emergency Liquidity Assistance], so that’s a positive step,” he said. Earlier today Reuters reported that a deal had been struck following an emergency Dáil sitting last night to approve the legislation that would liquidate the former Anglo Irish Bank. Taoiseach Enda Kenny is due to make a statement on the deal in the Dáil this afternoon. Email “Draghi says ECB "took note" of IBRC liquidation”. Feedback on “Draghi says ECB "took note" of IBRC liquidation”.